When you want to get away from it all, that doesn't mean you have to skimp on comfort and luxury at this Dubuque hotel. Located near the Mississippi River and Port of Dubuque, having quick access to the bounty of Mother Nature is simply sublime. After all, with the National Mississippi River Museum & Aquarium being close by, it's easy to lose yourself in the stunning beauty of the region. 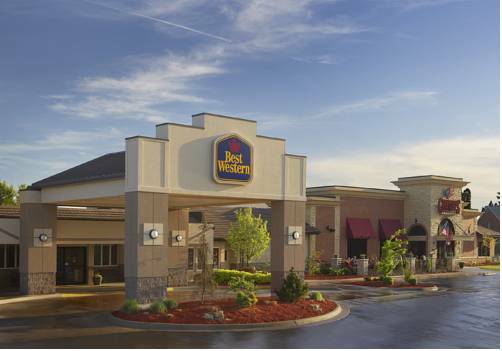 This upscale Best Western Plus Dubuque Hotel & Conference Center is ideal for your pleasure. Families in town to tour campuses are in luck. Loras College, Clarke College and the University of Dubuque are all just a short drive away. Indulge in a free full hot breakfast buffet before deciding on a college. Featuring hot eggs and waffles, pastries, fruits, yogurt, cereal and 100% Arabica coffee, that's some serious brain food. We're also connected to Champps Americana Restaurant & Bar, so you never have to go far for a fantastic meal. This Dubuque hotel features the largest indoor atrium and pool in the area for ahhh-inducing relaxation. Want more excitement? The Diamond Jo Casino and Mystique Casino are in the neighborhood. The Sundown Ski Resort is a fantastic way to spend the day. If hitting the slopes isn't quite your speed, you're minutes away from all festivals at this Dubuque hotel. The Dubuque Fighting Saints Hockey Arena, baseball fields, soccer fields and football stadiums in the area are prime for catching a game. Business travelers from John Deere, IBM , Industrial Park, Mercy Dubuque Hospital and Trinity and Finley Hospital are just a few of the guests that keep returning to our Dubuque hotel. Our conference rooms are spacious and well-appointed. We are also pleased to offer long-term stay rates and rooms. This award-winning hotel has officially set the bar for cleanliness, customer service and decor. Reserve your upcoming stay with Best Western Plus Dubuque Hotel & Conference Center for guaranteed luxury! Enjoy your stay. From: All directions. The Best Western Plus Dubuque Hotel & Conference Center is located on Highway 20 West, Dodge Street, two miles from Julien Dubuque Bridge. A much-loved civic symbol since 1964, when it stood outside the Pink Elephant Supper Club. Pinky wears a top hat.